Eighth District Councilman Al Austin speaking at a press conference in August in opposition to Senate Bill 649. Photos: Jason Ruiz. As the California legislative session came to a close this week with Governor Jerry Brown’s window to sign or veto bills into law expiring, Brown did neither to a piece of legislation that could have had wide-ranging impacts for cities across the state. Senate Bill 649 would have streamlined permitting processes for telecommunication companies to install small-cell antennas on publicly owned light poles, sidewalks and other rights of way. The telecom companies claimed it would help them roll out much needed improvements to erect a faster 5G network while municipalities across the state protested the bill stating it would strip them of local controls. In a letter to state legislators, Brown said that while a uniform permitting process, including the rates cities can charge for placement of these antennas on public property, could be beneficial, he was returning the bill unsigned so a better way forward could be found. In August, a group of elected officials from neighboring cities gathered in Long Beach to announce their opposition to the bill, calling it a power grab by the telecom industry and raising concerns that the “small cell” antennas could actually be a lot larger than the companies were letting on. Over 250 cities in the state had signed letters addressed to the governor asking him to veto the bill should it reach his desk. With Brown’s decision not to sign the bill into law cities will maintain their rights to negotiate with telecom companies on issues like how many small cell sites are allowable, what they must look like, and how much rent will be paid for the privilege of using publicly owned space for the game of private business. 8/30/17 at 1:36PM | As a bill that would severely scale back local control over the placement of small-cell antennas continues to progress through the California State legislature a group of local elected leaders held a press conference to announce their opposition to the law Wednesday morning. 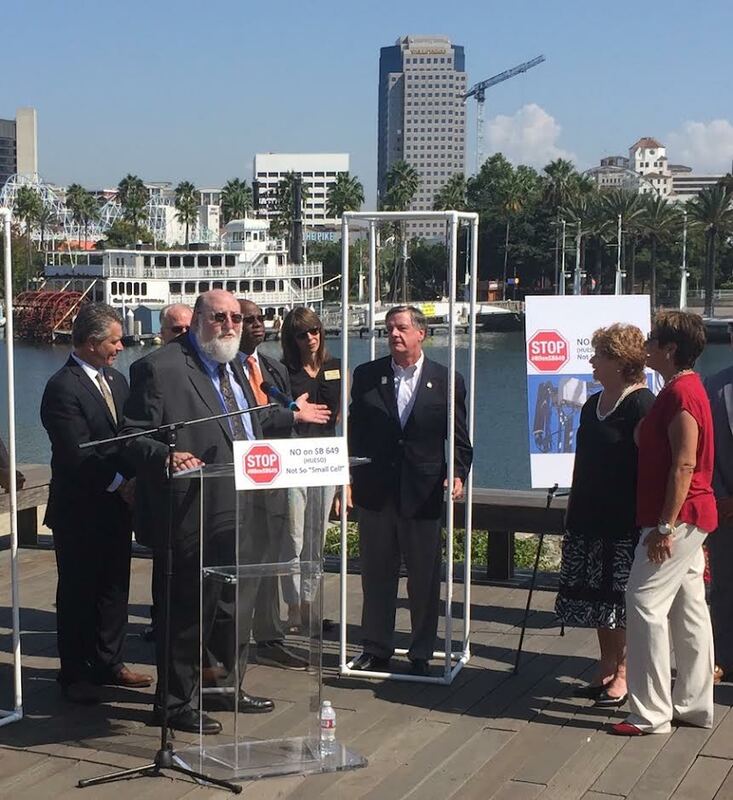 Representatives from Long Beach, Lakewood, Signal Hill and other members of the League of California Cities, standing with the Downtown waterfront as their backdrop, announced their opposition to Senate Bill 649, an effort that has been characterized as a power grab by telecommunication companies. The League joins some 250-plus cities that have spoken against the proposed law. If passed, the bill would limit localities’ ability to negotiate how big and where cell structures can be placed in their cities and could hamper their ability to charge telecommunication companies like Verizon and AT&T to lease space on city light poles and sidewalks. Eighth District Councilman Al Austin, who also represents Long Beach on the League’s board of directors, said that while the city supports advancements in technology, SB 649 is the wrong way to go about it. If passed, Austin warned that 1,000-2,000 such installations could make their way to Long Beach in the coming years with 100,000 expected statewide. The backdrop of the press conference, with the Pike Outlets, Aquarium of the Pacific and all of Shoreline Drive is not insignificant. The city council voted this month to allow Verizon to install 21 new light poles which will double as “micro cell” stations along Shoreline, Ocean Boulevard and other streets in the downtown area. However, that contract allowed the city to dictate that the installations match the existing light poles and that each pole comes with a $1,500 per year lease payment. In April, the city approved a “patch” to an existing ordinance to streamline the process of approving micro-cell sites but retained the city’s ability to require cables to be inside poles, antennas not to exceed the poles they’re posted on by more than 50 percent, no installation of new wood poles and that the poles be “visually compatible” with existing city poles. With SB-649, much of that would go away. The League of California Cities argues that local control would be handed over to the telecom companies which would get to decide what’s feasible in terms of design aesthetics. It also states that while the bill would allow for a new $250-per-pole fee to be collected, the special formula for determining the annual lease payment is so arduous—it requires cities to figure out the cost of ownership of individual poles, city spaces being used for the installations—that many cities would forgo the additional monies and settle for the $250 automatic payment from the telecom companies. It also disputes that the bill is being rushed through in an effort to facilitate the roll out of 5G networks pointing out that there is no language in the bill that specifies the type of technology that will be supported by the small-cell transponders. Dr. Jonathan Kramer explaining how large small cell installations can be. Dr. Jonathan Kramer, an attorney and wireless engineer who is part of the opposition to the bill, said that the small-cell mantra that the telecom companies is pushing is not entirely accurate. Using PVC pipe mock ups, Kramer instructed two of the electeds behind the lectern to step inside the structures to show how large they can be. The larger structure meant to mimic the size of cabinets that could pop up on sidewalks and the more slender but equally tall pole fixture both stood well over six feet tall and Kramer said that with four major telecom companies there could eventually be one small-cell installation for each company. “Regardless of what the industry calls this in terms of being small, I think normal human beings would not call these things small,” Kramer said. Kramer said the bill could have numerous lasting negative impacts by keeping cities from trying to facilitate expansion of services to underserved communities—Kramer says that’s strictly prohibited in the bill—to the structures themselves. He pointed to cell sites that are still up today that were installed over 30 years ago in noting that these new installations could last for decades to come. The discussion on the bill comes at a time when residents of Long Beach have stood in stiff opposition to a newly proposed land use element that would increase allowable heights of buildings to allow for greater density to accommodate the city’s growing population. A main argument made by multiple members of the public is that the land use element threatens irreparable damage to neighborhood character. While the land use element has been a topic of discussion in recent months, SB-649 has flown under the radar which prompted Wednesday’s press conference by local leaders. The bill is currently being deliberated in the California State Assembly’s Appropriations Committee where a vote Friday could send it to the full floor for approval. It could then be sent back to the senate for approval on any amendments that were made since entering the assembly before ending up on the governor’s desk for his signature. Kramer would not say if he was optimistic that the people’s voices would be heard. The over 250 cities that have spoken out against the bill represent over 95 percent of the state’s population, Kramer said, but the financial onslaught brought by the industry in trying to get this bill approved is tough to match for cities and their constituents.